Paint Pigments Used by Stone Age Artists in Cave Paintings and Pictographs.  When Were Colour Pigments First Used?  How Did Stone Age Man Improve His Use of Colour Pigments?  How Did Prehistoric Painters Obtain Their Colours?  Where Did Prehistoric Artists Get Their Pigments from?  What Colours Did Stone Age Painters Use? see: Prehistoric Art Timeline (from 2.5 million BCE). Cave Painting in "Hall of the Bulls"
dating from about 17,000 BCE. When Were Colour Pigments First Used? "Anatomically modern man" (Homo sapiens sapiens) was creating, mixing and using colour pigments many millennia before he began drawing or sketching. The discovery of a 100,000-year-old "paint workshop" in the Blombos Cave, in South Africa - complete with various ochres, bones, charcoal, grinding-stones and hammer-stones, abalone shell containers and mixing vessels, but with no evidence of contemporaneous cave painting - suggests that the pigments were being used for body painting and face painting, rather than cave art. The same can be said for archeological sites in Australia, such as the Arnhem Land rock shelters Malakunanja II (53,000 BCE) and Nauwalabila 1 (53,000 BCE), where used lumps of red ochre pigment were discovered, but no sign of any Aboriginal rock art. In other words, by the time that modern humans started to create the first prehistoric art, a reasonable minority of them would have had some experience in sourcing, extracting and blending pigments for personal decoration, if nothing else. In his book "The Art of Prehistoric Man in Western Europe", the paleolithic scholar Andre Leroi-Gourhan (1911-86) describes how the floors of Stone Age caves and rock shelters were commonly impregnated with a layer of reddish ochre, up to eight inches deep. Leaving one in no doubt that Aurignacian people dyed their bodies, their animal skins and their spears, that in fact ochre was used for decorative purposes in every aspect of their domestic life. How Did Stone Age Man Improve His Use of Colour Pigments? Most prehistoric artists, however, would have learned on the job. Their first cave painting would have been monochrome, made from earth or charcoal and mixed with crude binders like saliva or animal fat. Many have no doubt faded or have had newer paintings superimposed upon them. A larger number have probably vanished altogether. Even Stone Age painters who had experience of pigments would have had to improve their methods, since many of the colours and hues used to dye bodies, faces and hair were made from from animal and vegetable sources, which were only effective in the short-term. It took time and experience for artists to switch to mineral-based pigments which didn't fade, but by the end of Aurignacian art (roughly 40,000-25,000 BCE) nearly all rock art was done with mineral-based materials derived from iron oxide, manganese and kaolin. Time was also needed to master the use of "binders" - additives (like animal fats) needed to bind the paint and help it to stick to the surface being painted - and "extenders" - additives (like crushed bone) that help the paint to cover a larger surface area. 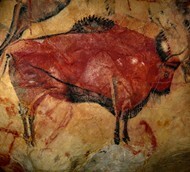 In the Franco-Cantabrian region, which is traditionally regarded as "the" centre of Paleolithic art, cave paintings are generally red or black. The red colours were made from iron oxides, such as hematite. The black colours were made from either manganese dioxide or charcoal. Some artists relied on preparatory sketching, either by making a charcoal drawing, or by engraving an outline in the rock surface. Others began painting immediately. To begin with, they applied the pigment with their fingers, or with some sort of 'paint pad' made from moss or lichen. Next, they developed paint brushes made from various types of animal hair, or 'crayons' made from solid lumps of pigment. (Note: In Australia, the fine detail see in Bradshaw paintings is believed to have been applied with feather quills.) Finally, they tried blowing pigment onto the rock surface through tubes made from hollowed-out animal bones or reeds. How Did Prehistoric Painters Obtain Their Colours? Stone Age artists relied on several different types of material to make the colour for their painting. Clay ochre was the main pigment and provided three basic colours: yellow, brown and numerous hues of red. For black pigment, artists typically employed either manganese dioxide or charcoal, or burnt bones (known as bone black). For white pigment, they used kaolin or ground calcite (lime white). These colourants were first ground up to powder (using animal shoulder bones as mortars), then mixed with cave water (high in calcium carbonate) vegetable juice, animal fats, blood, bone marrow, albumen, and urine to help it adhere to the cave wall. In addition, they used extenders like feldspar and biotite, or ground quartz and calcium phosphate (from crushed animal bone), in order to save on the pigment, to make the paint adhere more firmly to the cave wall and to prevent the paint from cracking when drying. Where Did Prehistoric Artists Get Their Pigments from? Nearly all paint pigments used in caves were sourced locally. Where clusters of caves existed, such as in the Dordogne region of southwest France, the occupying artists would have used the same mines for their pigments. And as Stone Age painters discovered that pigments from earthy iron oxide deposits did not fade as fast as colours derived from animal and vegetable sources, they went to great effort to locate a good supply of these dyes: the majority of prehistoric settlements show signs of well-used trails leading to hematite mines or digs where such pigments were obtained. For example, excavations in the vicinity of the Lascaux Cave complex suggest that Paleolithic artists may have travelled as far as 25 miles for a reliable source of pigments. There were only four colours in the Australian aborigine's palette; red ochre, yellow ochre, china clay, charcoal. His palette was much used in the north, diminishing as he went further south; it was apparently unknown in the southwest. It is uncertain if this absence was due to lack of ochre. Earthy clay pigments were unequally divided across the continent; but the Australian, who travelled very little, made excursions to obtain the most valuable of them all, red ochre. The pigments were first watered down; then, with his finger or a piece of frayed wood used as a brush, the artist spread the background tint, generally yellow ochre. After drying it, he traced on this background a broad red line, or some other motif, like the paw of an emu. In this way he decorated cave walls and ceilings as well as domestic items such as the handle of a tool, a wooden basin, or similar utensils. This art of organising red, black or white lines on a yellow background demanded a technique of its own; for it was a form of language. The prehistoric colour palette used in African cave painting by Bushmen artists consisted mostly of earth pigments. Reds and browns from bole or haematite; yellows, orange and reds from ochre; white from zinc oxide; blue from iron and silicic acid; blacks from charcoal or soot. The blue pigment used in Africa is especially unusual and does not appear in the parietal art of Europe. What Colours Did Stone Age Painters Use? Nearly all the colours used by Paleolithic artists are founded on mineral oxide (either iron or manganese) or carbon (mostly charcoal). Thus their limited palette was produced from three primary colours: red, black and yellow. Blacks were derived from manganese ores and charcoal; the reds, yellows, and browns came from limonites and hematites (ochres and siennas), in a range from reddish brown to straw colour. Tones of red-violet were probably a result of natural peroxide of iron transformed slowly and naturally into violet oxide. Here are the five most important mineral-based pigments used in parietal art during the Stone Age. Ochre is a mixture of fine clay and iron oxide which comes in a variety of colours including yellow, red, orange and brown. Yellow ochre gets its hue from an iron oxyhydroxide mineral, goethite; red ochre gets its red hue from its content of hematite; brown ochre obtains its distinctive hue from manganese. Limonite, containing iron hydroxide, is the main ingredient of all the ochre pigments. When limonite is heated, it converts to the reddish hematite and becomes red ochre. Ochre was the first colour pigment to be used by prehistoric humans, up to 300,000 years ago at the Twin Rivers site in Zambia. Also known as hematite, ochre is found all over the world, and has been employed by almost every Paleolithic, Mesolithic and Neolithic culture, as paint for cave pictures, pottery, the human body and various artifacts. Yellow and red ochre pigments have been found in the caves at Pech Merle, Altamira, and Lascaux, to name but a few examples. Umber, an earthy pigment, usually brown or reddish-brown, contains both iron oxide and manganese oxide. It is typically darker than the other earth pigments, ochre and sienna, although its exact hue depends upon the amount of iron oxide and manganese it contains: the more manganese, the darker it is. When heated, raw umber turns a darker brown colour, known as burnt umber. Lighter than Umber, Sienna is another earth pigment that contains both iron oxide and manganese oxide. In its raw state, it is yellowy-brown and is known as raw sienna. When heated, it turns partially into hematite and becomes a reddish brown colour, known as burnt sienna. Tests on some of the parietal art at Lascaux have revealed that Stone Age artists obtained their "black" colours from a range of manganese oxides, including: the jet-black groutite, the brownish-black hausmannite, and the dark steel-grey to black manganite, as well as the rarer dark brown or brownish black todorokite and birnessite. Interestingly, there are no known deposits of these minerals in the locality of the cave, suggesting that supplies may have been sourced from more mines up to 250 kilometres away. Kaolin (also called china clay or kaolinite) so-called after the towns of Gaoling or Kao-Ling in Jiangxi province, China, is one of the world's most common minerals. Commonly used as a white colour pigment in Stone Age art, it is a soft, earthy, white mineral, occasionally rust coloured by a higher iron oxide content. By heating kaolin clay, Stone Age artists increased its whiteness and hardness. Monte Castillo, Puente Viesgo, Cantabria. This shelter has the world's oldest cave painting (hand stencils and prints). See also: Earliest Art around the world. This rock shelter is noted for its red ochre paintings of animals and an anthropomorphic figure. These images are the world's oldest figure paintings. Chauvet has the world's most beautiful animal paintings of the Aurignacian period. Noted for its engraved figures of mammoths and aurochs. Oldest carbon-dated cave painting in Australia. Note: For more Aboriginal paintings, see: Ubirr Rock Art in Arnhem Land (c.30,000 BCE); and pre-Estuarine Kimberley Rock Art (c.30,000 BCE) in the northernmost region of Western Australia. Noted for its hand stencils rock art and other Placard-type signs. World famous for its dramatic pictures of Dappled Horses. Renowned for its Aviform pictographs, known as "Placard type" signs. World famous for its "Hall of the Bulls" and the "Shaft of the Dead Man", Lascaux contains iconic images such as the "Great Black Bull", the "Unicorn" and the "Bird Man". Represents the apogee of Solutrean art and, together with Altamira, it is one of the greatest ever sites of Stone Age colour painting. Renowned for both its abstract signs (c.34,000) and its glorious multi-coloured ceiling pictures of bison (c.15,000), it is regarded as the greatest example of Franco-Cantabrian cave art during the Magdalenian era. Most spectacular Magdalenian art after Altamira, Font-de-Gaume. Noted for its monochrome animal drawings with black outlines.  For more about prehistoric painting materials and methods, see: Homepage.